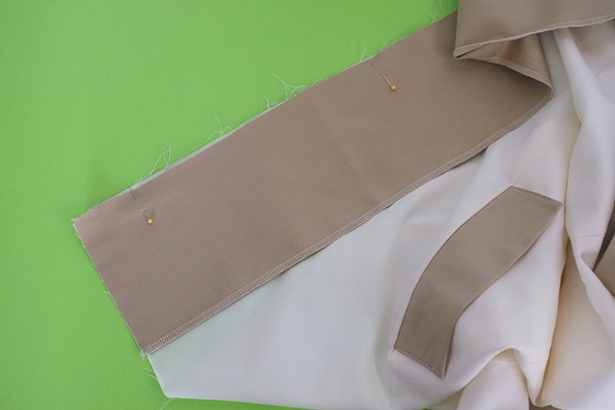 Last week I ended off with sewing the storm flap pieces together and now it’s time to attach them to the coat inside the shoulder seam. 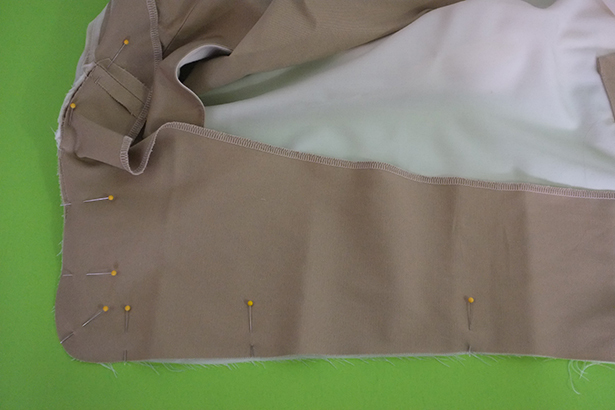 So I pinned the right shoulder seam (on the wrong side), right sides together first serge-finishing the edges. 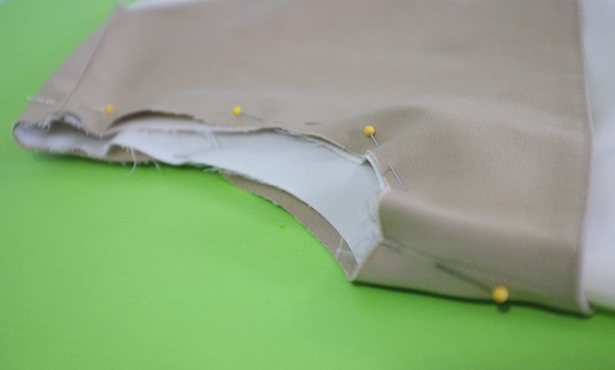 Then I stitched the seam together and press open my seam allowances and flipped to the right side. 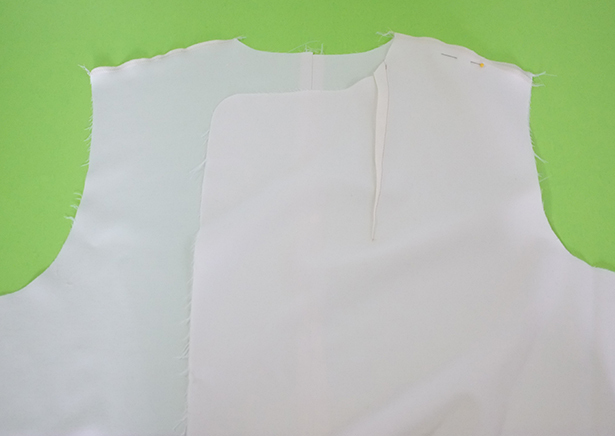 I grabbed my sewn storm flap and pinned wrong side to right side with my coat matching up the un-sewn shoulder seams and the sewn shoulder seams together. 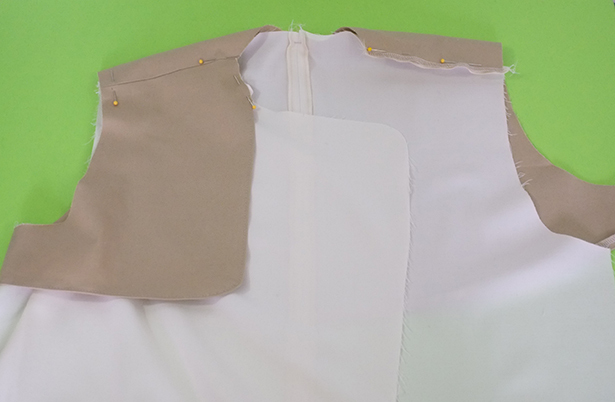 I shifted the storm flap out of the way on the side that had the shoulder seams sewn and stitched the coat side seams right sides together. 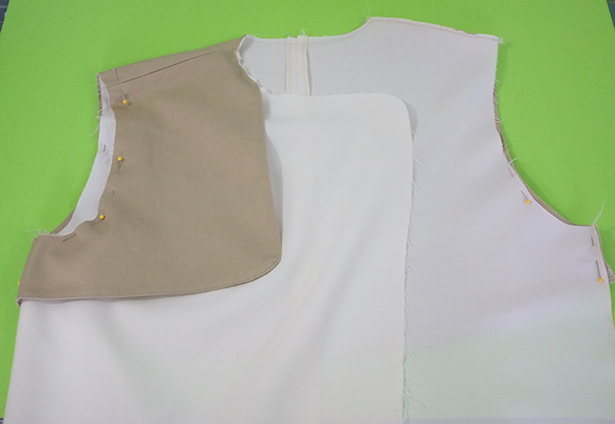 Then I was able to pin the armholes together. 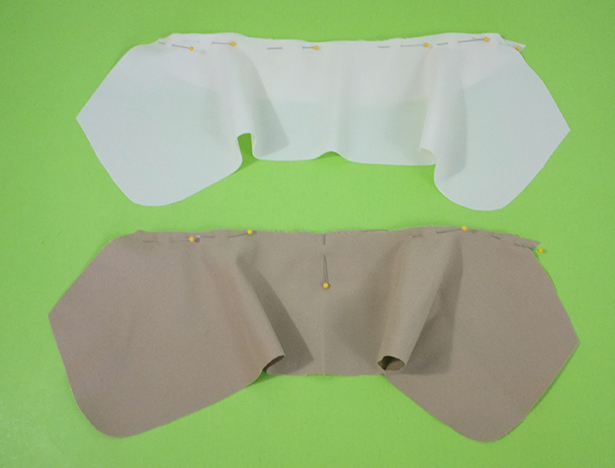 I basted the armholes together as well as the one un-sewn shoulder edge inside the seam allowance. 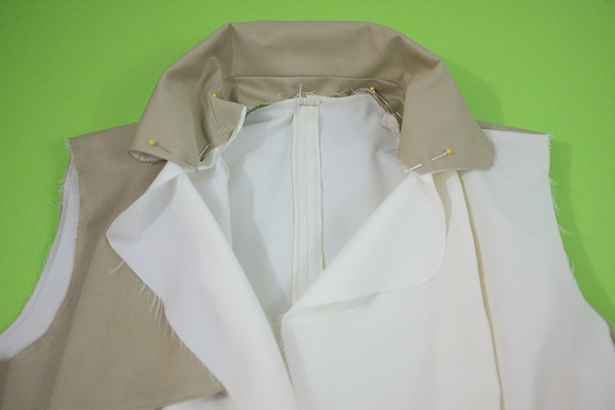 Then I pinned my other coat side seam, right sides together sandwiching the storm flap in-between the two layers. 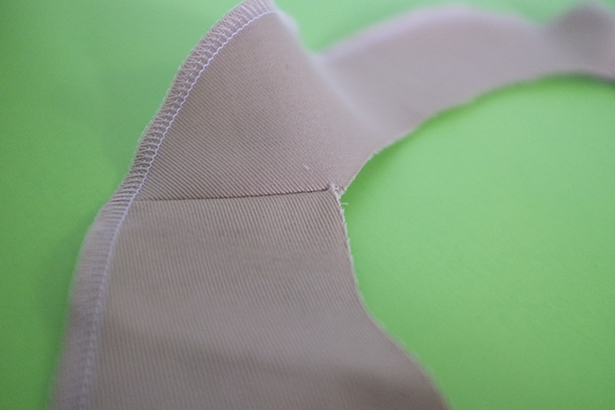 Finishing my side seam edges separately first, I stitched together and press my seam allowances open and flipped to the right side. Looking good so far! Now it’s collar time! I grabbed all my collar pieces including both the upper and stand pieces for both the under and top collar. 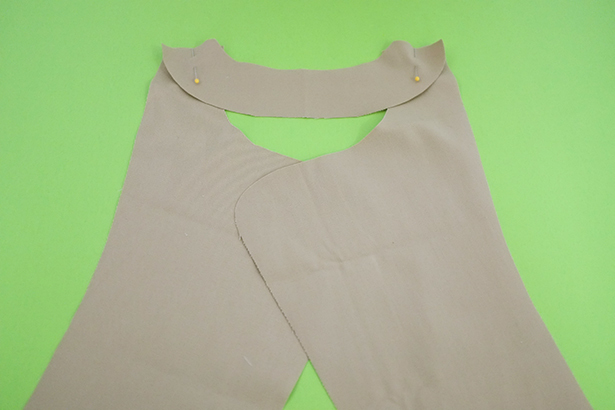 I pinned each collar stand piece to the collar right sides together along the curve. 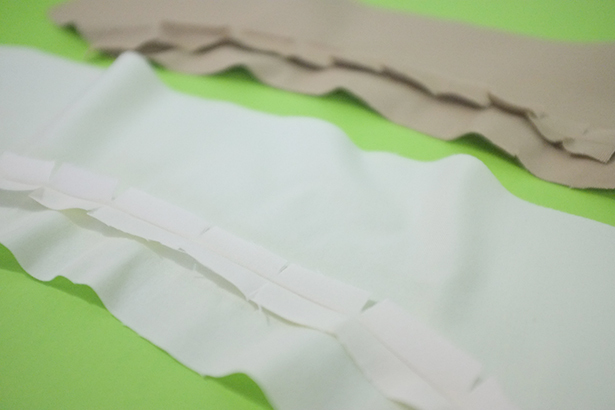 Then I stitched them together and pressed my seam allowances open. I had to do some clipping in order for my collar to lay nice and flat. 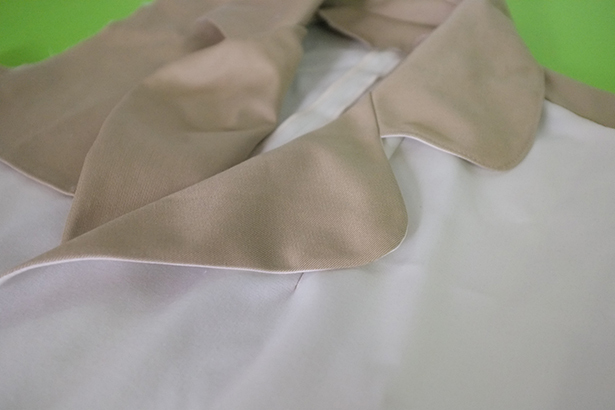 Next was to pin each sewn collar piece right sides together from point to point. 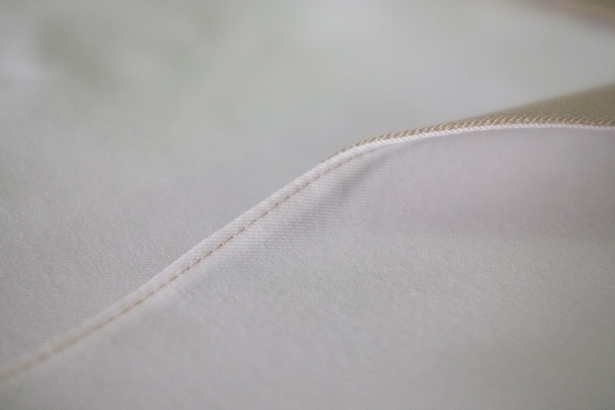 I then stitched together, graded my seam allowances, flipped to the right side, pressed and topstitched around the edges and basted the open lower edges of the collar together. 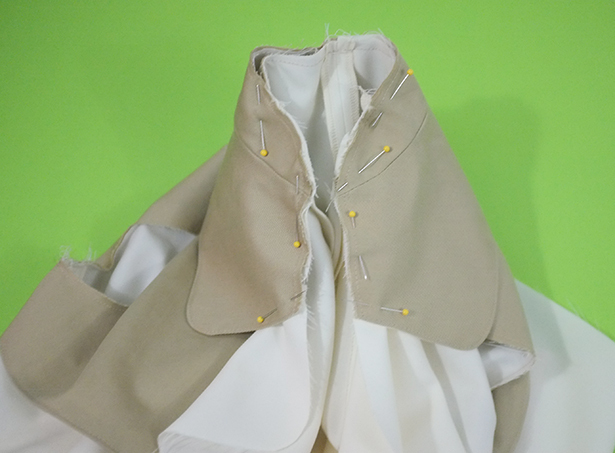 Using my notches as a guide I pinned my collar to the neckline of my coat also matching up center backs. 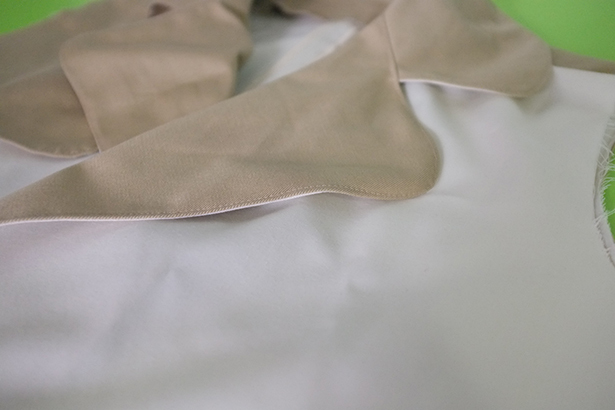 I made sure the under collar (ivory) was facing down on my coat. 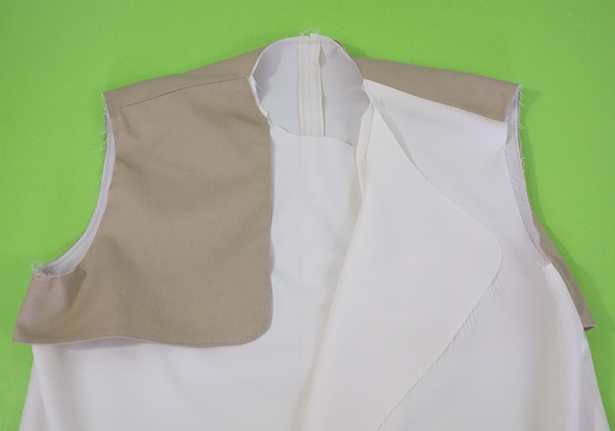 I also had to work around the lower collar shape and use lot’s of pin to secure in place – then I basted to my neckline inside the seam allowance. Next I grabbed my facing pieces and note I did not interface these facings as I didn’t want them to have much structure. 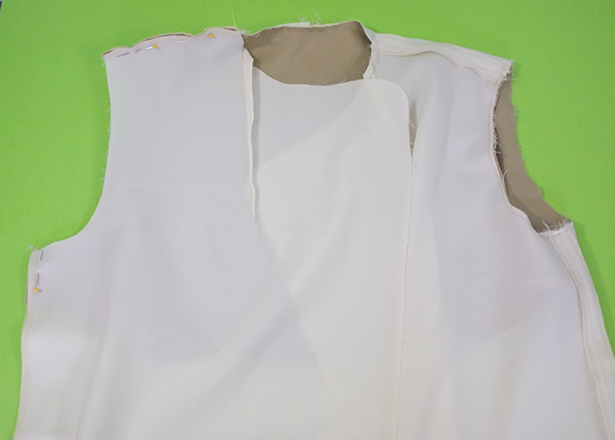 I stitched the shoulder seams together, pressed allowances open and then serge-finished around the outer edge. 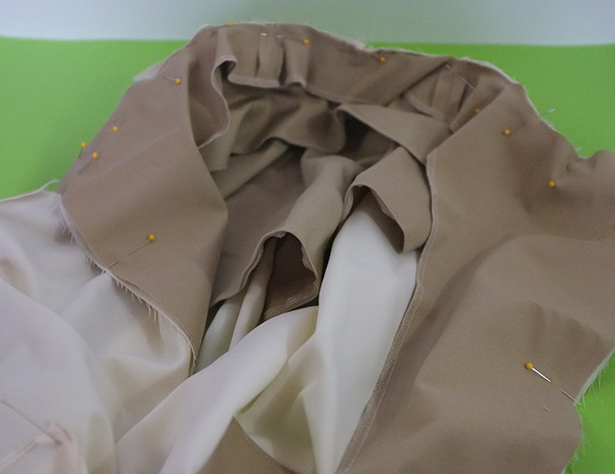 Now it was time to sew my facing pieces to my coat! 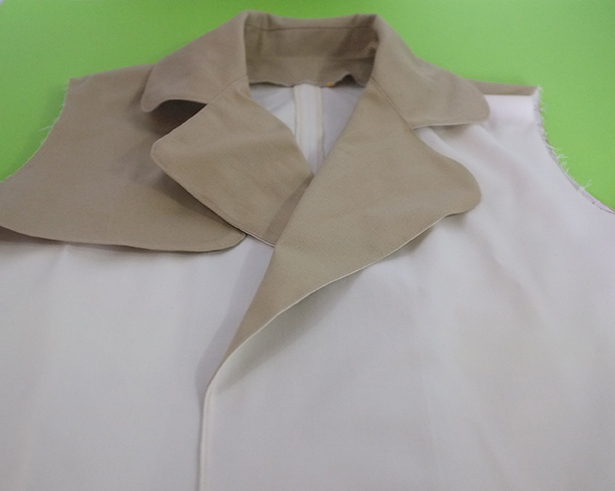 With the collar already basted to the neckline, I started pinning my facing right sides together with my coat starting at the hem. 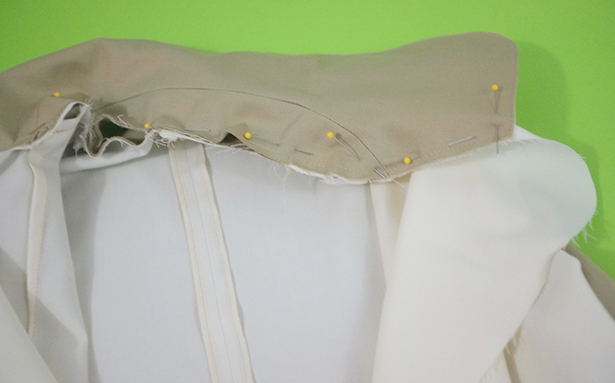 I continued to pin my facing matching up the shoulder seams and pinning around the notches. I used lot’s of pins! 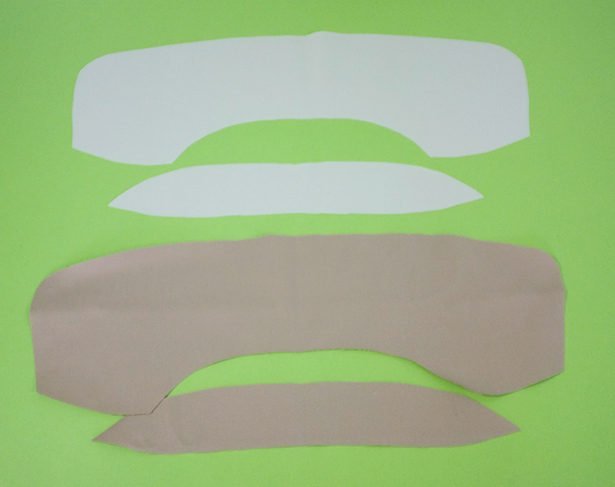 After stitching my facing around I clipped and graded my seam allowances. 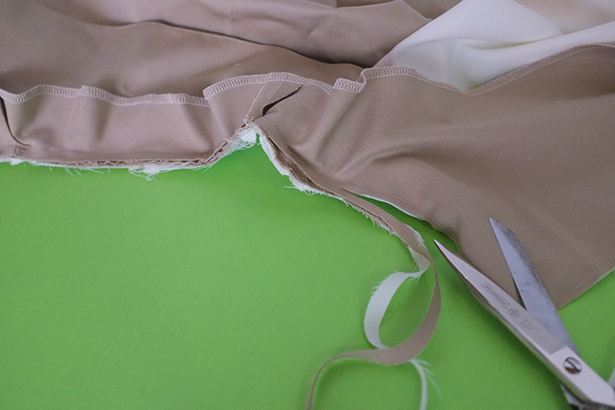 Then after a lot of pressing and “rolling” the seams – I flipped my facing to the inside. 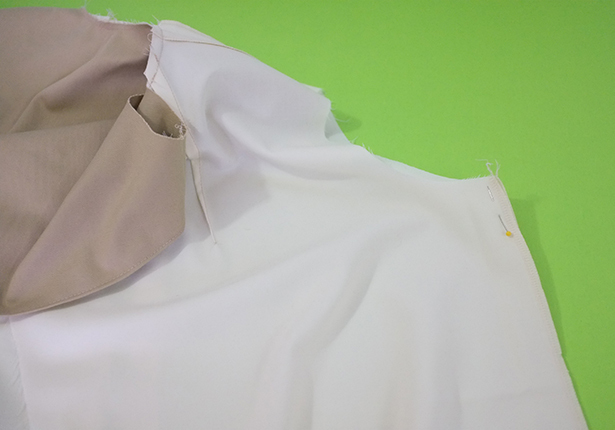 This revealed the awesome notched collar! At the hem I reopened my facing and pressed up the hem allowance after serge-finishing the edge. 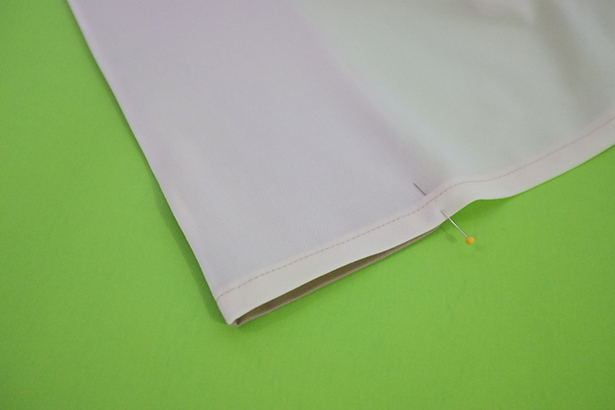 Then working from the right side I topstitched the hem in place. 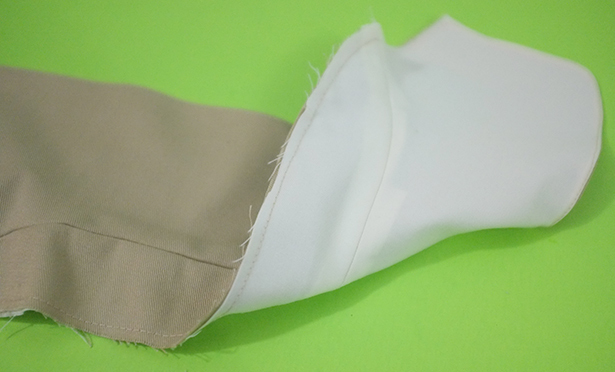 I then folded back my facing and pinned to the inside at the hem – I’m going to hand stitch this in place later. 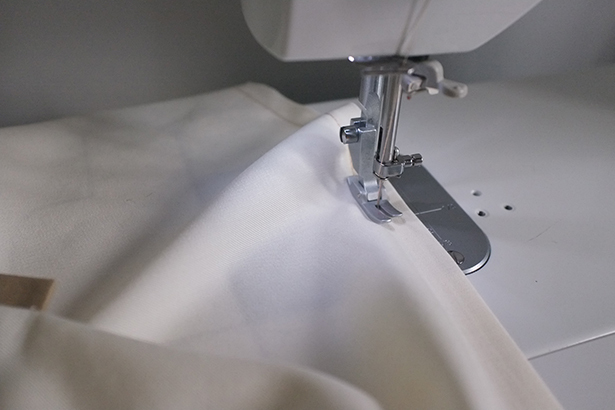 Starting at the hem stitching, I topstitched around the entire front opening. 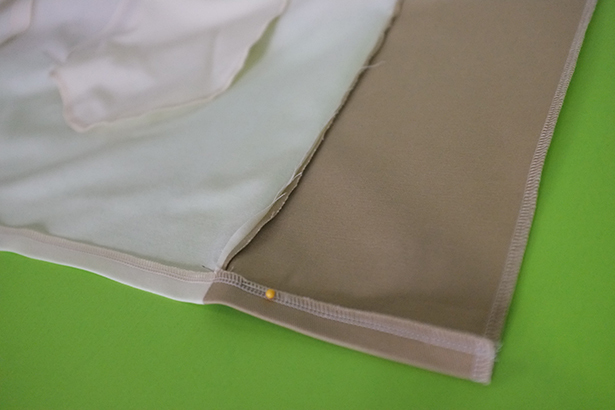 I really like contrast topstitching that brings in the beige! 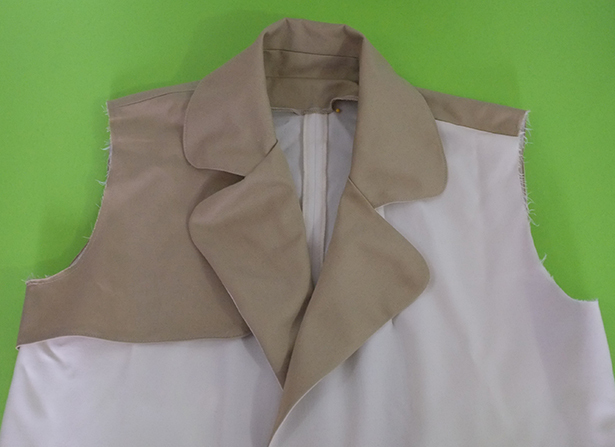 Now all that’s left are the sleeves and the belt – stay tuned for next week when I finish up this Trench Coat.